Teachers and department heads work in the self proclaimed 'war-room' at Stonewall-Flanders Elementary in preparation of the STAAR test. 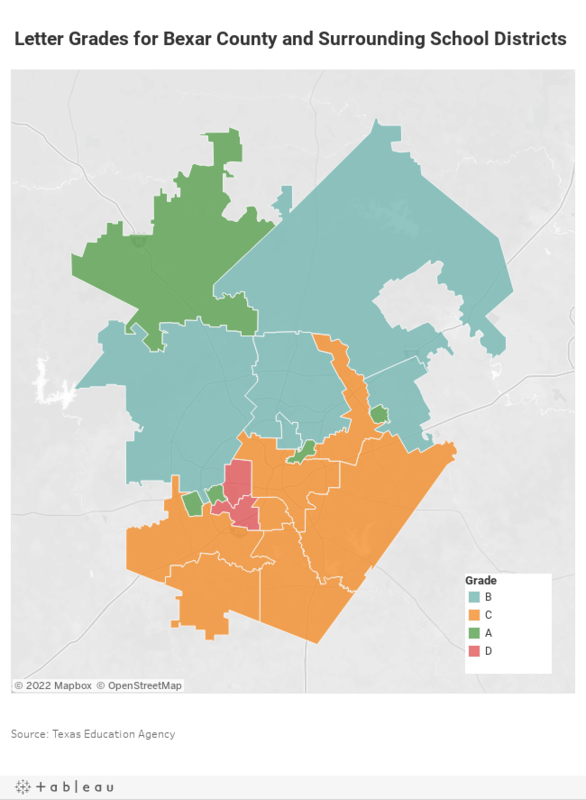 This story has been updated with information on Bexar County’s charter school’s accountability ratings. The Texas Education Agency released its ratings for all districts and campuses Wednesday following an overhaul of the state accountability system that replaced “met standard” and “improvement required” ratings for school districts with letter grades of A through F.
Both campuses and districts received a number score of 1 through 100 based on three categories: student achievement, student progress, and closing achievement gaps. The final category measures how well specific student populations perform. Districts alone received letter grades, while campuses were awarded “met standard” if they scored above 60 and “improvement required” if they did not. Commissioner of Education Mike Morath described the A-F system as the “fairest” Texas has ever used. Morath said while other letter grade accountability systems are often criticized for having a strong correlation between failing grades and poverty, he believes Texas’ system does not. As a result of the scores – and a state law that incurs penalties for any school receiving five consecutive “improvement required” ratings – one San Antonio Independent School District campus will close following the 2018-19 school year. SAISD announced to parents and staff last week that Rodriguez Elementary would close at the end of the school year, and district officials are looking into ways to reopen the school by fall 2020. Throughout the rest of San Antonio, 38 campuses in public school districts received an “improvement required” grade, including 16 in San Antonio ISD, six in Edgewood ISD, five in South San Antonio ISD, three in East Central ISD, two in Southwest ISD, two in Northside ISD, two in North East ISD, one in Harlandale ISD, and one in Southside ISD. “Improvement required” campuses make up approximately 4 percent of all traditional public schools. The majority of statewide “improvement required” campuses are elementary schools. 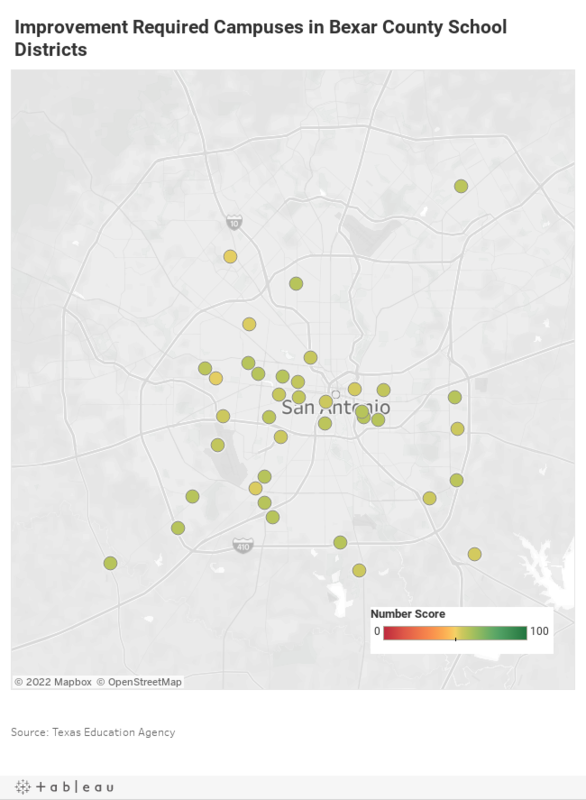 San Antonio’s “improvement required” schools are largely new to the rating. All but six of the 26 area campuses rated “improvement required” last year received a “met standard” in this year’s accountability rating system. One of the schools that received an “improvement required” was Ogden Elementary in SAISD, which now has received a failing grade for five consecutive years. However, because of a partnership SAISD leveraged with Relay Graduate School of Education, state law permits Ogden reprieve from accountability consequences for an additional two years. Districts were rated on an A through F scale, with three districts scoring an A, three districts scoring a B, seven districts scoring a C, and two districts scoring a D. No public school district in Bexar County scored an F.
Some district officials and school administrators have been critical of the A-F ratings, saying they reduce a complex assessment of a school to a simple letter. The Texas Education Agency also issued grades for Bexar County’s 22 open-enrollment charter school districts. Many of the charter schools received top marks: Heritage Academy, Basis Texas, Harmony Science Academy, Great Hearts Texas, George Gervin Academy, School of Science and Technology, and School of Science and Technology D all received an A.
Jubilee Academies, New Frontiers Public Schools, and Brooks Academy of Science and Engineering received a D. The lowest scores of an F and “improvement required” were given to Por Vida Academy, Carpe Diem Schools, and Bexar County Academy. Districts were not given a letter grade if they only had one campus. Carpe Diem Schools announced earlier this year it would close. Across the state, 18 percent of public and charter school districts scored an A, 43 percent scored a B, 30 percent scored a C, 7 percent scored a D, and 2 percent scored an F.
Click here for a full listing of all accountability grades broken down by letter and number. How did charter schools do? BASIS, George Gervin Academy, Harmony, Great Hearts, and School of Science and Technology all got “A”s. There were some charters with “C”s. Hi Jim and Rosie – we updated the story with further information about charter school performance. Thanks! I think your charts say it all. Poor ratings are concentrated in central and southside of the city. I don’t believe all the central and Southside school districts have terrible administration and staff. That only leaves parents and their children as the contributing factor to the poor ratings. Let’s call it the way it is and quit blaming teachers for poor academic performances. By the way, it doesn’t seem, based on the ratings, that charters are the end all be all to fixing the problem of children who are not progressing satisfactorily. You should look into property values and compare. It’s not about parents failing kids, it’s poverty and lack of opportunity in poorer school districts. It’s a complicated issues that involves many aspects, including how much money the state spends per student in poor districts versus property-rich districts, how charter and private schools are undermining primarily urban public schools, crime rates, police coverage of poor urban areas, education levels and language issues in poorer communities. It’s good to look at “grades” but are many more layers to this onion. Yes and poverty is related to parents. I taught in SAISD and the teachers were professional employees who had the basic tools to make students successful. More money would not improve the outcomes. I question what the school and district grades really mean. LBJ, a former teacher himself, believed that funding for the war on poverty included money to improve children’s health, nutrition, housing, and education. It was a holistic approach to solve a complicated problem. LBJ’s idea was never to micromanage how the teachers taught or to bombard students with a battery of standardized, expensive tests. Get the federal money to the states, LBJ believed, and let them determine how best to spend the funds to help the “whole” child. Fast forward to today and we have bureaucratic school systems that micromanage every part of a teacher’s and student’s day to ensure “accountability.” Needless paperwork and endless initiatives. A elementary school child takes a multiple-choice test to see how well she understands art instead of actually letting the child create art on her own. The metrics used for these grades rely almost exclusively on test scores, a boon to publishers with lobbying ties to state lawmakers. It’s still all about our inequitable funding of education. How will more funding fix the problem? More money will not produce results. Look at Sam Houston HS, every kind of state and federal grants were awarded to that school, enhanced local funding, additional staff, lower student to teacher ratio never produced acceptable results. How did SAISD cope with that failure, they simply refocused the school’s educational target, vocational, technology partnership, etc. conduct a research of it’s focus since Melanie Hammons was principal.